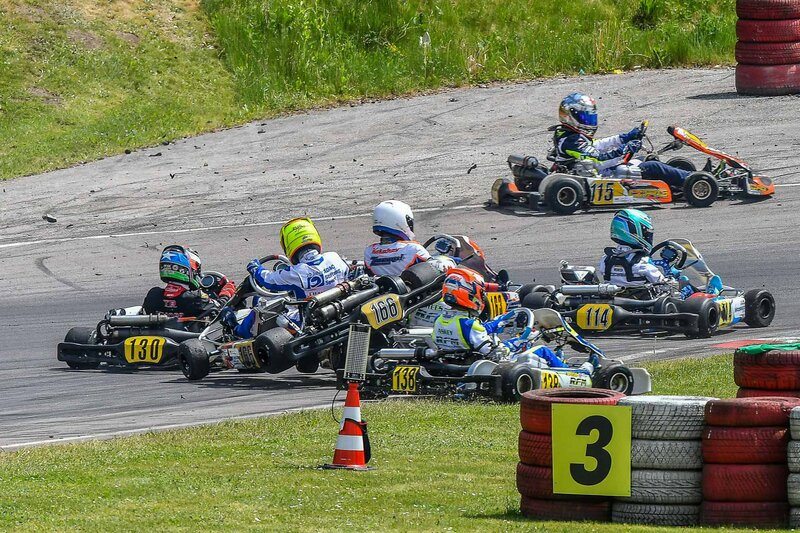 The third round of the Deutsche Kart Meisterschaft (DKM) (German Championship) was held in mid-May at the Wackersdorf Kart Circuit in the district of Schwandorf in Bavaria, Germany. Kai arrived at this event as the current Championship leader thanks to his 2nd and 1st place finishes in the finals at the previous round. 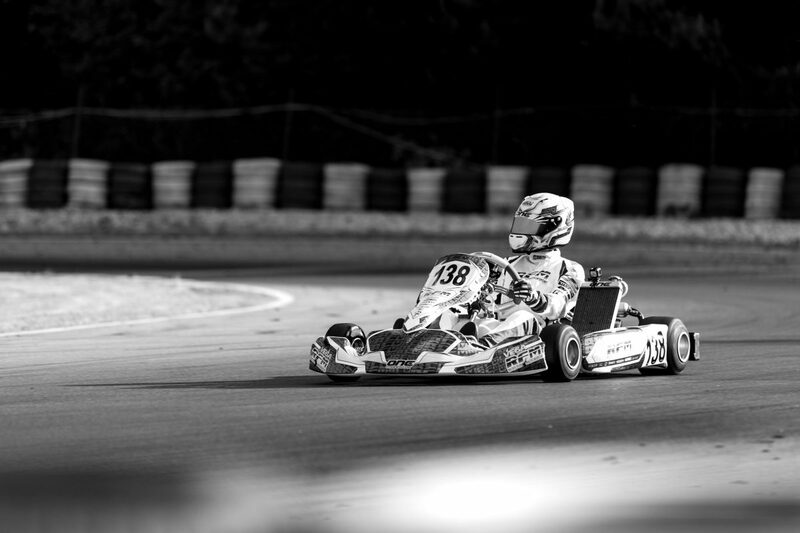 The last time Kai raced at Wackersdorf was nine months earlier in the X30 Euro Series where he qualified on pole, won two heats and finished 4th in the final. rm-up, in qualifying he managed to get a good track position and posted the second fastest time in his group, a 48.478 sec lap, just 0.148 sec off the fastest. With the track primed by rubber laid down by the first group the second group went quicker still placing Kai 7th overall after the merge. The 44 junior drivers were then split into three groups (A, B & C) to compete against each other in a total of three heat races. Kai’s two eight lap heat races took place in the late afternoon of the Saturday, the first on a warm, dry track and Kai drove well and finished 4th. 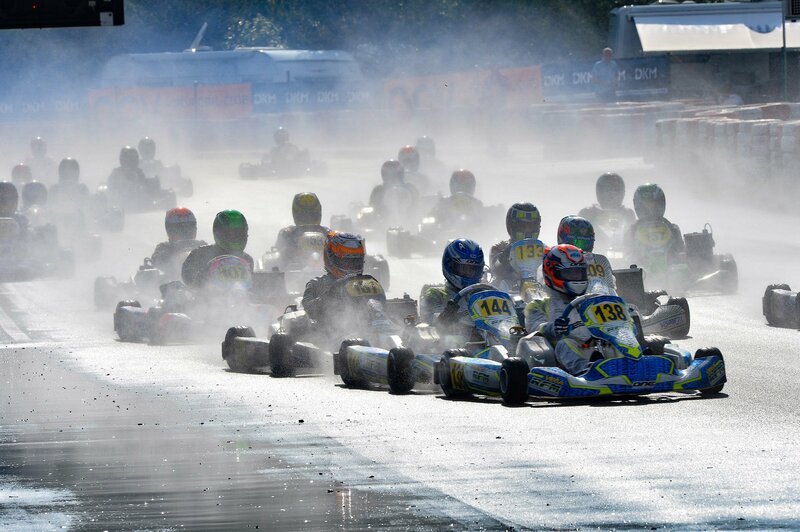 Just before the second heat there was a heavy downpour of rain, at the start Kai was swamped by other karts and fell back to 12th, he pushed hard for the remaining 8 laps to finish 8th. 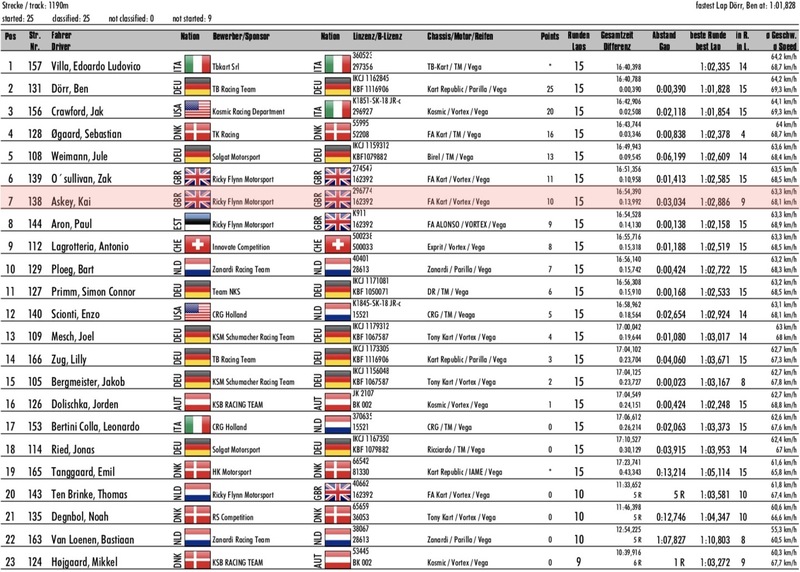 Combined results from his two heats placed him 7th overall which would be his grid position for the first final the next day. DKM rounds feature two 17 lap final races (top 34 drivers) with trophies and equal championship points awarded for each. 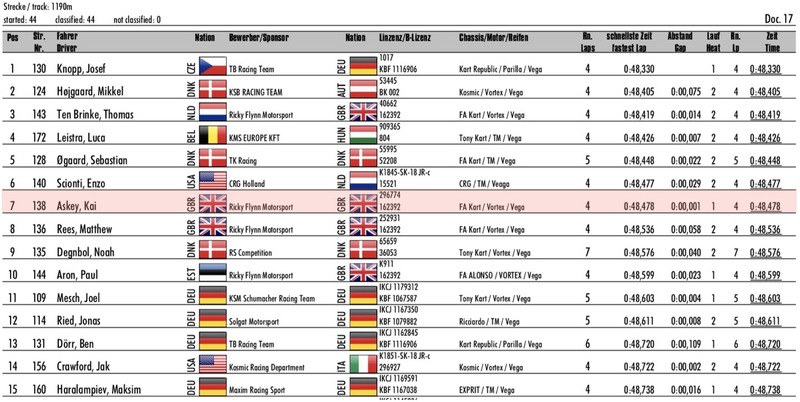 Kai started the first final in 7th place, he made a good start and was side-by-side with his team mate Matthew on lap two when another driver crashed into Matthew without braking and took both him and Kai off. Both karts were damaged and neither could continue. This was a bitter blow for Kai as not only would he receive no points for the first final but it would mean starting the second final from the back of the grid. 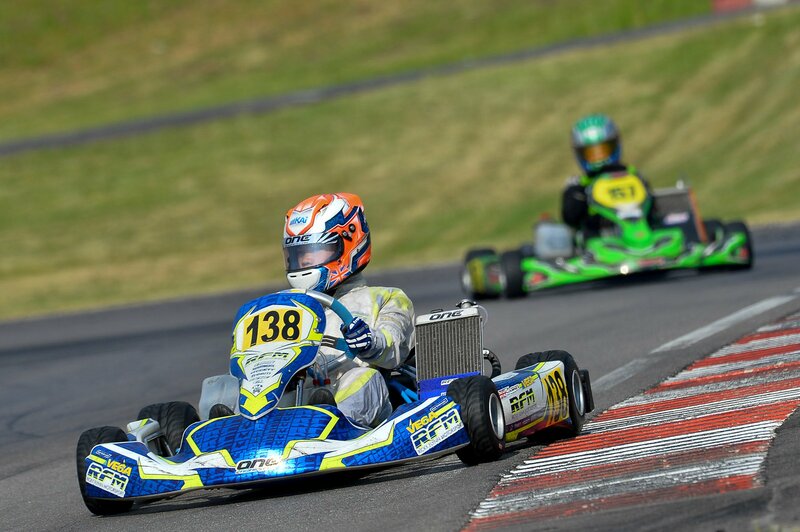 Later that day the second final got underway and Kai took a cautious approach to the start, as things turned out this was a wise approach as there was a large accident directly in front of him at the second corner. Kai had to take avoiding action cutting across the grass (photo above). The race was immediately stopped (red flagged), the grid reset and the race restarted. This time Kai made up no less than 15 places to 18th before the race was once again red flagged because of a two separate incidents. The race director then decided to postpone what would be the second restart until after all other final races had run at the end of the day. As the day went on the sky turned darker and just before the scheduled restart of the final it begun to rain, drivers were allowed to switch to wet tyres before lining up on the grid. A single-file restart was carried out on a wet and slippery track, Kai used all of his UK wet driving experience to move up from 18th to finish an amazing 7th. 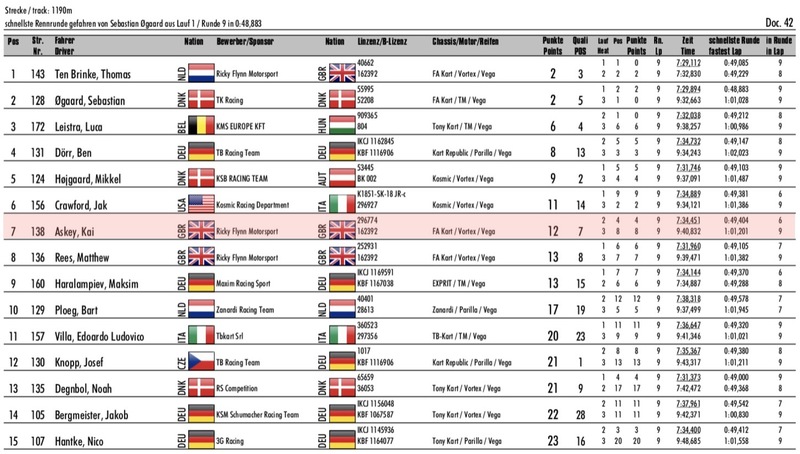 An excellent drive from 33rd to 7th which earned him a valuable 10 points (plus 6 earned from the heats) means that he continues to lead the German Championship by 8 points.